Every March, thousands of bus drivers, Transperth staff, volunteers, businesses and schools join forces for a good cause, to raise money for Radio Lollipop. 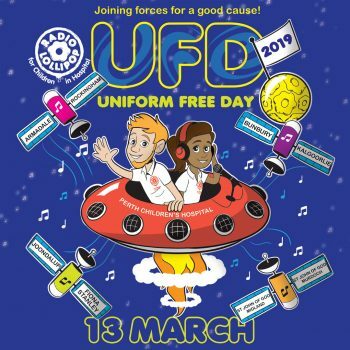 Uniform Free Day is the major annual fundraising event for our charity in Western Australia. Collection tins are placed on buses and passengers are asked for a donation from drivers who have traded their uniform for costume. Collections are also done throughout the Perth CBD, at regional bus depots and at businesses and schools across the State. We will also be setting up a stall for the very first time in Yagan Square from 6am to sell some of our wonderful merchandise. The event is an essential source of revenue and a very valuable community campaign to generate awareness of Radio Lollipop and build support for the work our volunteers do every day to brighten the lives of sick children in hospital. Radio Lollipop volunteers provide a radio and play program on the wards at Perth Children’s Hospital and across eight other hospitals in Western Australia. Our programs reach children as far as Kalgoorlie and Bunbury, from the little tots to those edging towards adulthood. We provide care, comfort, play and entertainment for all children and their families. Funds raised from this year’s event will keep our music on the air and broadcasting live to children around the State. And it will assist with the costs of providing games, craft and supplies as well as covering some operational costs such as licensing and internet services. Radio Lollipop volunteers give a sense of normality to children in hospital and a very welcome distraction to what is often a traumatic experience for the whole family. Every donation makes a difference for our volunteers, our programming and our mission to reach every sick child in hospital across the State.